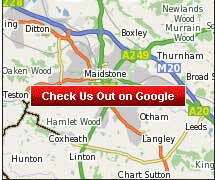 Maidstone Locksmiths offer an affordable guaranteed service with top quality workmanship and branded locks. Any service you book is carried out by a tradesman vetted by the UK Locksmith Association and CRB police checked. We are Trading Standards Approved. We respond most urgently to any lock out calls in our area and we'll keep you informed of our arrival time. We are specialists in non-destructive entry and more than 90% of our calls are resolved quickly and neatly, drilling out locks is only a last resort, not our first option. We will re-key locks to secure against lost or stolen keys. We make no charge for call outs and we offer you free quotations at fixed prices. If it happens that we can't solve your lock problems, you won't owe us a penny. John mended a residential back door that would not lock. Such a professional, honest and fast job, there should be more people like John in the world. My experience with John has renewed my faith in locksmiths. I will definitely use John again. Excellent efficient locksmith very punctual did a great job and cleared up the wood shavings after fitting the lock. Very reasonable price and was able to cut spare keys on the premises. Fantastic service, prompt, efficient, helpful and friendly. I have had the lock changed at my new property, very happy with the service provided. New gear box on upvc door. Fast and quality, would highly recommend. Great job, fast and reliable. Thank you. Replaced lock on garage door. Would definitely use again and wouldn't hesitate to recommend. Although the job was small, it was important and carried out in a very professional manner. New conservatory door lock fitted. Great service, arrived early, very skilled and better now than before needing replacement. Replacement of 'up-and-over' garage door lock. He arrived on time, explained cost and what needed to be done. Was very polite, helpful and the job was done exactly as required. Would definitely get John back for any other locksmith work and highly recommend him. Mended a faulty lock on my kitchen stable door. Such a nice man. Did an excellent job. I shall certainly contact him in future should I need work done. Repair to post boxes in apartment block. Prompt and efficient and polite. Replace locks in uPVC door. Prompt flexible service, great workmanship, very helpful man. John did a great job realigning the lock so our front door now closes and locks smoothly. He was on time, courteous and friendly. New cylinder fitted to front door lock. Front door lock needed new multi point barrel. John responded to my call, arrived earlier than expected. Advised on what needed changing, gave a price and carried out the work immediately and proficiently. Also readjusted another door lock. Fitted new lock on the front door as the existing lock was broken and didn't lock. John was very quick to my house after I called him, knew within seconds of seeing the lock what the problem was and how to fix it. Gave me a quote straight away and had the materials on his van so he could start immediately. He was a very friendly bloke and I would highly recommend his work to others or use him again in the future. New locks fitted to front door and bathroom, bathroom window levered back into position. for us without an exorbitant price, we wouldn't hesitate to employ his services again. Efficient, friendly and professional service. Very prompt and efficient, nothing too much trouble. Replacing lock on back door. Supply and fit new lock to outside door. reasonable cost, excellent job done. I called John this afternoon for an emergency lock change and he arrived within 2 hours, completed the job and was on his way. Would not hesitate to use him again. Repairs to two doors with jammed locks. then came back to fit parts that needed ordering. Punctual and a very nice man. I would definitely recommend him and use him again. Unlocked a seized door, and replaced a multi point lock. Highly recommend Maidstone Locksmiths. My door seized shut, so I did a bit of shopping round for prices as I had a rough idea what needed to be done. They gave me an estimated quote over the phone and booked me in immediately at my convenience. On the day, he was bang on time, extremely friendly, and most importantly, very efficient. He had the door open and repaired within the hour. Literally. Very nice man, extremely professional, and extremely well priced compared to other locksmiths out there. Very reasonable price indeed. Will use again if I ever have to. Fixing locks on uPVC windows. Great communication, managed to fit us in a day earlier than expected. A very genuine and honest tradesman, very professional with a wealth of knowledge. I will be highly recommending John. John answered my email questions really quickly. I then phoned him the following morning to arrange a time. He arrived promptly within the hour. John was polite and chatty. Also very informative. When he left the property he had cleared up and you wouldn't have known he'd been here. If I ever need a locksmith again for any reason, I would definitely use John. Absolutely recommended. Replacement lock, repair to door frame. Fast, honest, reliable and friendly. Fitted new gear box to lock on garage door. Very impressed. Gentleman tried to see if it could be repaired but it was impossible. Friendly, prompt, well equipped, good attention to detail. Lock on porch door changed - screws and hinges checked. and how much completing it would cost. Expertly fitted lock with minimum fuss. Very good service. Friendly and helpful. Gain entry - locked myself out. Arrived within 10 minutes of call. Tried multiple methods to gain entry, in interest of preserving lock. Very kind and polite. Put me at ease. Really lovely gentleman. Will call again if ever needed. Excellent, took approx 20 minutes. Removal of a damaged door lock and fitment of new lock. Courteous and attentive, good standard of work. Key jammed in closed door lock. Lock forced open without damage, lock adjusted and working well. Lock changed, side door locks changed. Accessed front door after being locked out. Used before when I locked myself out and knew straight away to use again. Prompt, polite and friendly and accessed front door quickly. Happy customer once again! Prompt polite service. Very helpful and sorted problem straight away. Friendly and good price. Gain entry and fit new lock and gearbox to French doors. The rear door now works better than it did when new with no sticking. First class - brilliant, old school trustworthy service from local professional - no rip off prices. Arrived earlier than expected (called ahead to check that was ok). Needed more work than initially thought, John was able to complete the extra work and informed us of the added cost before he started. He didn't leave until he was done and we were completely happy. Gained entry to a locked house where the lock had broken. Very professional and timely service. Couldn't have asked for more under stressful circumstances. Lock on patio door out of alignment. Changed the front door's mechanism as they were faulty. Excellent job, very happy with it, lovely guy. Door lock changed and provided new set of keys. Brilliant service very quick to arrive friendly and efficient and would highly recommend. Changed cylinder on front door lock. I was very impressed, he explained what the problem was and carried out the work efficiently and in a cheery way. Absolutely fantastic, called and he came straight round as I'd locked myself out. Got me in within seconds and also gave me helpful tips and advice for security. Number is saved and I will recommend to all who need a locksmith and will use again if I lock myself out again! 100% could not fault. Porch door lock sorted out and new handles. Replaced barrel on broken lock. Very fast, very courteous man. John came when he said, fixed the problem and was very tidy and a very reasonable price. Entry and new lock fitted. Very friendly and professional service. Would recommend and use again. Flood door lock changed to gain entry. I phoned Maidstone Locksmiths as my only spare key was posted through my letter box by a man working at my house. I was in a bit of a panic and this company couldn't have been more helpful. I was given a quote straight away and the work was carried out promptly. Professional, Timely and Efficient ... Absolutely dumbfounded with the Excellent service. New locks on moving house. Excellent service. Friendly and courteous. Gave advice and options on lock. On time. Change six locks and check door hanging and lubricate and adjust all locks. Fitted new hall door lock. Excellent service. John was with us within hour of our call to replace the lock. New locks back and front doors after keys stolen. Mended lock bathroom window also. Very pleasant helpful and knowledgeable. I can thoroughly recommend John's work. Superb work, very friendly and reliable. Gain access and new lock fitted to patio door. Excellent service, he was able to come out immediately to remove and replace the broken lock on our patio door. Very professional and would not hesitate in recommending. did extra repair work for an agreed price. I would use again. Very professional and able craftsman. We were very pleased with the quality of the work undertaken. Would definitely use again. Lock broke on uPVC door - entry gained and lock replaced. Was locked out of home - very pleased with service and fast response. uPVC Double glazed door gearbox replacement. Friendly quick reliable service, all work carried out well, clean and tidy job, recommended. Front door out of line and could not lock. Over the year this is the second time I have needed a locksmith. Both times have been excellent. Thank you. Came out really quickly, we are very happy to use them again. Gain entry, fit new night latch (ERA). Arrived when he said. Very quickly worked out what the problem was and how to solve it. Had spares he needed in the van. Very conscientious, neat and tidy. New keys fitted for conservatory. Prompt and friendly service, got the job done quickly and charged agreed price. Gain entry after key broke in 5 lever lock. Arrived within 30 minutes of calling and carried out work to prevent it happening again. Polite and efficient would definitely recommend and if needed would use again. the agreed time. The cost was acceptable. Lock fitted to garden gate. 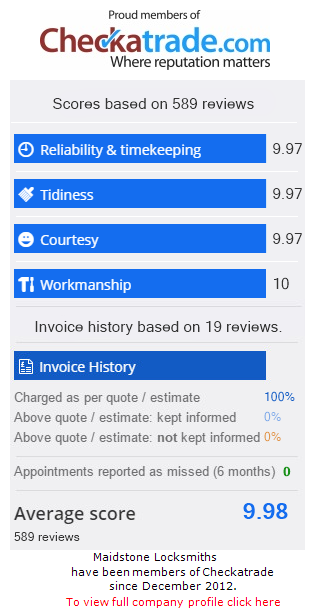 Very polite and friendly, prompt response to emails, happy to provide advice, thorough and high quality work, provided service exactly as we wanted. Would most definitely recommend. Sticking front door lock inspected and fault diagnosed. I can't praise this company and John enough. John arrived on time and within moments had diagnosed the fault with our front door. John is an extremely nice guy and explained what was causing the issue in great detail. If you want a friendly and reliable locksmith, you really can't go wrong with this company. I will definitely be using this company again should I need to. Adjust doors and new springs. Very prompt response to callout. Very polite. Excellent workmanship, would highly recommend. My front door lock cylinder was changed as it was worn out. The service provided was professional, polite, pleasant, informative and cheerful. Gain entry and fix a new lock. Very impressed. A very fast response, an hour at the most from the initial phone call to the work being completed. Arrived at agreed time and completed work as agreed. Excellent efficient and friendly service at a very good price. Fit new cylinder to front door. The job was done with great care and the result is excellent. Excellent service - turned up on time and rang me at work so that I could leave and meet him there in my lunch hour. Did a brilliant job. Back door lock repaired and front door lock repaired/adjusted. Came quickly and fixed both my locks. Was very polite and respectful of the property. Adjusted keeps, fixed lock mechanism, adjusted garage door. Excellent service, arrived on time, assessed and carried out work as discussed. Quote agreed up front. Nice guy. Removed broken key from front door and adjusted patio door to be able to lock. Fantastic, polite professional tradesman. Arrived promptly the day after we called for a non emergency call out. Removed broken key from front door and adjusted someone else's work on the patio door so that it locked better too. Very pleasant. Would definitely recommend. Opened failed front door and fitted new lock. Here within 20 minutes of my call. Gained access to the house through faulty front door within 5 minutes. Installed new lock and checked, making adjustments to the point the new mechanism worked better than when the door was originally fitted some years ago. Very polite and informative. Excellent service. Entry needed into a room following the lock being faulty and denying us access. Very quick turnaround and great reliability. Fitted new lock on back door. Fit new front door cylinder. Front door lock assessed unable to repair so new lock fitted. Friendly, punctual, tried his best to fix lock before decision made that new lock needed. Kept me updated and fitted in around my limited availability. New front door lock supplied and fitted. I lost my front door key and needed a replacement lock for security. John came within 24 hours and was bang on his predicted arrival time. The new lock was very quickly fitted. Fast Efficient and Friendly. I would highly recommend. Gain entry, uPVC door replaced gearbox, 1/2 hour approx. 100% excellent, courteous, helpful, quick response. Gain entry, UPVC door, replaced gear box. Very friendly and polite staff, cheap and quick. New locks fitted in plastic door. Two worn and broken external door locks replaced. and would fix things as cheaply as possible.